Baking soda is present in the homes of most people, and there is a reason for it, in fact, a hundred of them. Baking soda( or sodium bicarbonate) is a real miraculous substance that can serve countless different purposes in the household. It is a powerful home cleaning agent, a versatile natural remedy, a beauty care product, and much more. Apparently, it is also an “inexpensive, safe way to combat autoimmune disease,” including arthritis! Namely, a study conducted at Augusta University’s MCG Department of Physiology found that baking soda regulates the pH levels of the body, and fights inflammation. According to Dr. Paul O’Connor, a physiologist, and co-author of the study, the consumption of sodium bicarbonate normalize our pH levels by encouraging the production of stomach acid, and thus prevents indigestion and stomachache. To test these benefits, Dr. O’Connor and his team used an experiment that involved both humans and rats, who received a mix of water and baking soda over a period of two weeks. The results showed that the sodium bicarbonate caused the immune cells to suppress inflammatory responses, even in people who had inflammation issues before the experiment. The study showed that baking soda stimulates the stable production of stomach acid which is vital for the proper digestion of food, and thus controls inflammation. Additionally, it acts on both the stomach and the spleen, by calming the immune response and strengthening the anti-inflammatory response. In this way, it warns the body about the attack, and it “switches off” already-activated inflammation markers. As arthritis pain is a result of a weak immune system and overactive inflammation signals, baking soda effectively relieves it. 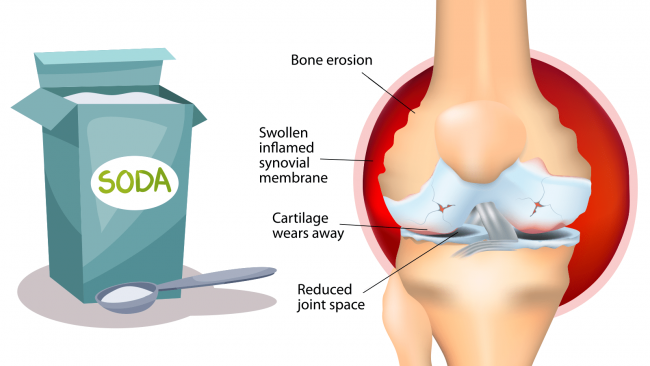 “Considering the devastating side effects inherent with rheumatoid arthritis drugs, the idea that something as safe and inexpensive as baking soda water may alleviate the inflammation driving this and other autoimmune diseases is as welcome as it is intriguing. Indeed, the drugs commonly prescribed for rheumatoid arthritis are among the most dangerous on the market. On the other hand, baking soda causes no such adverse effects and is an affordable and safe way to soothe the pain and the other accompanying symptoms of this condition. Furthermore, it also improves health in numerous other ways, so make sure you consume it in water daily, and allow it to do wonders for your health!